The latest huge new discovery of 2013 were acrylic inks (used to paint “Fog over Trasimene“). 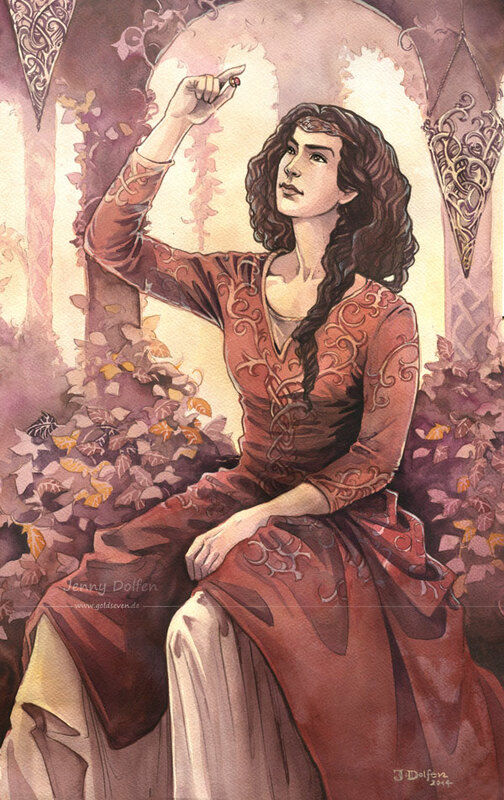 They’re quite similar to watercolours in many ways, but more versatile. 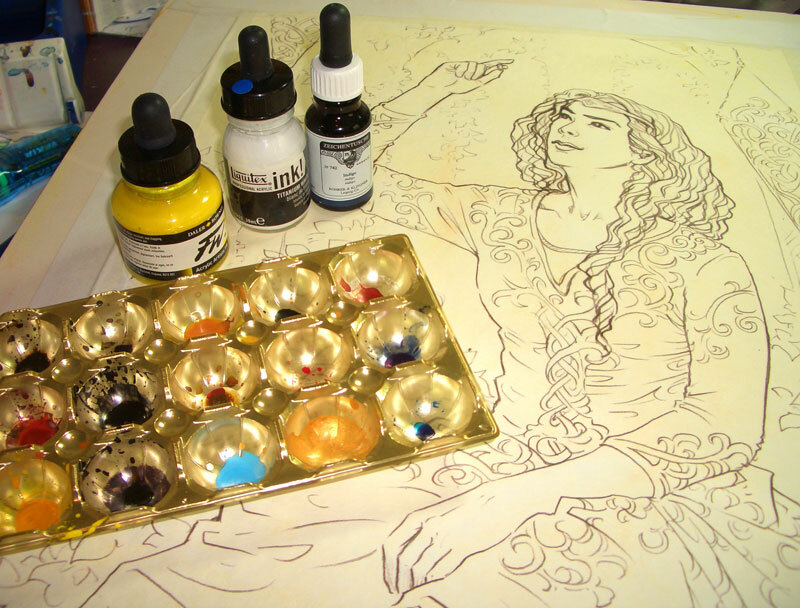 They come in little bottles with eyedropper lids, just like the liquid watercolours I love to work with. I’m working with three different brands here: FW Daler/Rowney Acrylic Artists Ink; Rohrer/Klingner Zeichentusche (drawing ink); and Liquitex Ink. The handling is almost identical to watercolours: I use them with my normal watercolour brushes, thinned down with water or undiluted. No changes there. All the brands I use come in different opacity levels: from transparent like actual watercolours to opaque, and in this case, opaque is really opaque. I work with a selection of mainly transparent ones, to preserve my watercolour look, but have a few opaque ones, mainly light tones like white, for highlights. In order to keep them apart, I used small blue self-adhesive dots to paste on the opaque ones, so I don’t accidentally grab the wrong bottle. Like watercolours, different pigments have different lightfastness ratings. I’ve made sure only to buy lightfast paints. 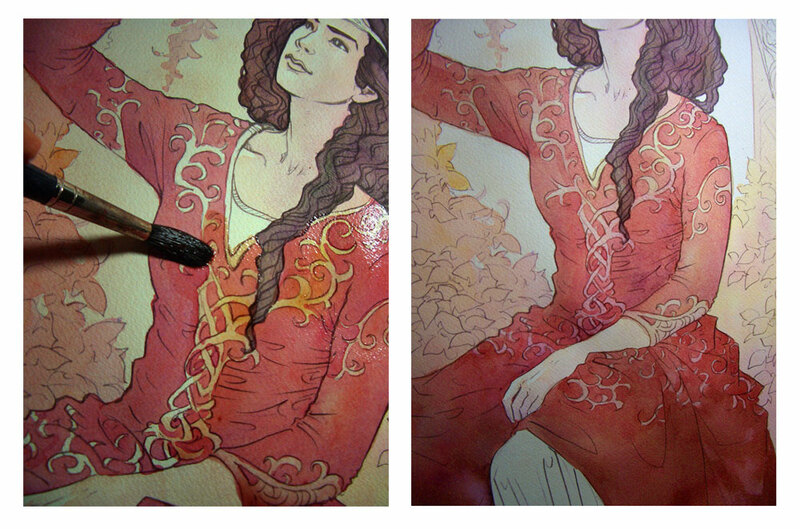 The other huge difference is: when acrylic dries, it’s completely insoluble. When you add layers in watercolour, you will always slightly dissolve bottom layers. In acrylics, you can use completely transparent layers that leave all the detail work in place underneath. Whether you add dark shadows or light fog – I did both in the “Trasimene” pic linked above – it opens a world of opportunities. 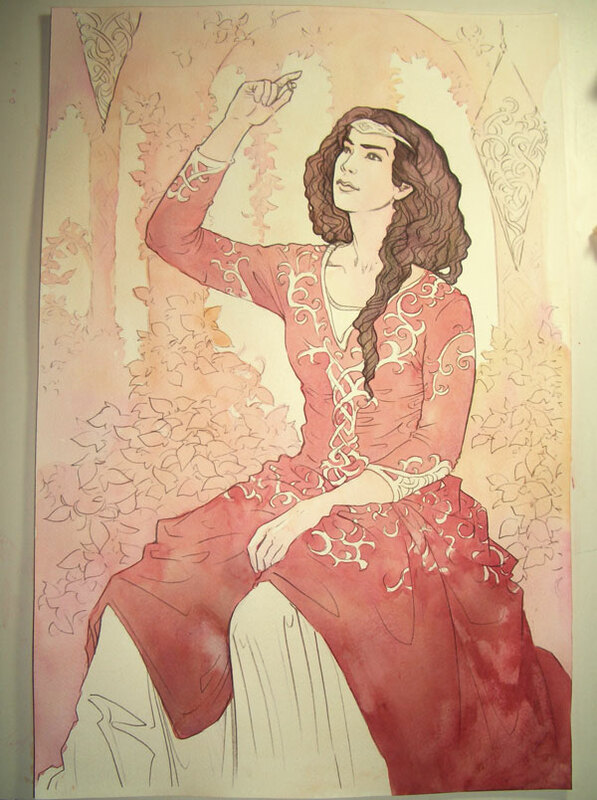 With watercolour, you have to work from light to dark, for several reasons. You can’t paint light skin next to black hair; the black hair will run into your light skin. And you can’t add light colours atop dark ones. In acrylic, you have no limitations. You can put dark hair down and later add a light yellow across the whole image – nothing will run. You can add light highlights to dark areas – just use opaque paint. The downside of that is: your palette. With watercolours, you can reuse, rewet, and clean palettes without problems. Liquid acrylics are pretty much there to stay. With tube acrylics, that’s bad enough; with liquid ones, you have the additional problem that you need a palette with small “pots”. My solution is a lucky one – in Germany, we have outrageously yummy sweets called “Toffifee”, which come in little blister packs. They’re perfect for liquid acrylic palettes. When I’ve completely mucked them up, I can just throw them away. So now I have a great excuse to keep buying Toffifees. Yay. The picture is a commission for the wonderful Paul, for whom I’ve already done “A Sorrowful Meeting“. It’s his character Laerminuial, a Noldo jewel smith from Rivendell. I haven’t arrived at the definitive paper for acrylic inks yet. I’ve tried around with Canson Montval and Schoellershammer – Montval tends to cake ever so slightly, but Schoellershammer has some really unfortunate speckling qualities, so Montval it is. Generally, I’m still working with watercolour papers, as I still want the overall feel to be more watercolour than acrylic. In the photo below, the first light yellow wash is already in place. I had one huge “PANIC!” moment connected to liquid acrylics: They speckle when wet. Dramatically. Most dramatically: Rohrer/Klingner Antique Gold Green. When this happened for the first time – in the face, of all places – I did panic, and ripped up the whole thing. Later, after the ripped-up painting had sufficiently dried in the dustbin, I saw that the face was perfectly smooth again. And that even works with Rohrer/Klingner Antique Gold Green. When the background wash had dried, I applied some basic wet-into-wet washes for the columns and shrubs, allowing the colours to mix on the paper. I did the skin in the same soft rosy wash. This works pretty much like watercolour. Overall, the following steps all mimic my usual watercolour techniques. Now comes one of the wonders of ink. 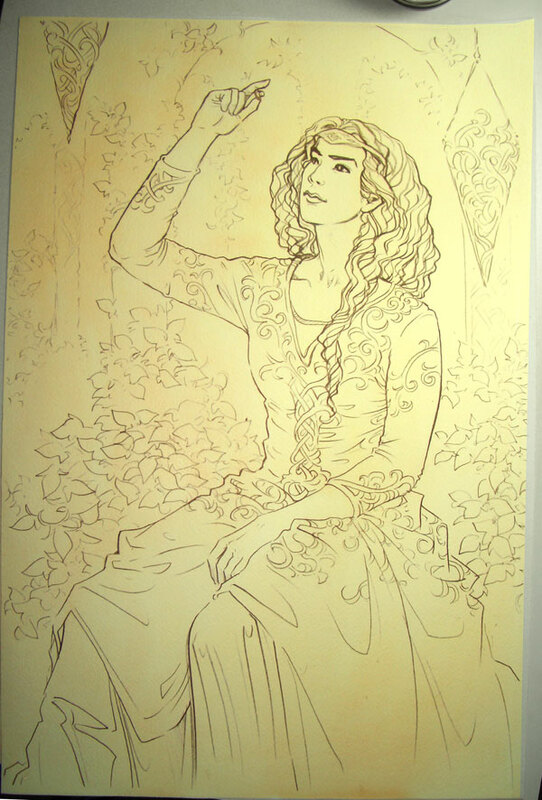 In order to give a colour to the ornaments on her dress, I can just lay a wash over the whole thing. I can tint, I can darken – all in transparent ink; the paint underneath is left untouched and crisp. If I tried the same thing in watercolour, the layer underneath would blur. 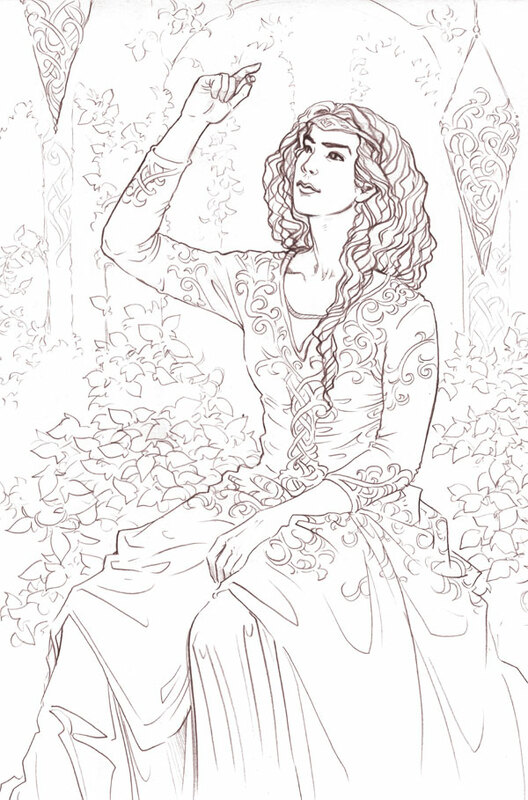 More detailing to the shrubs, skin, lamp, and dress. 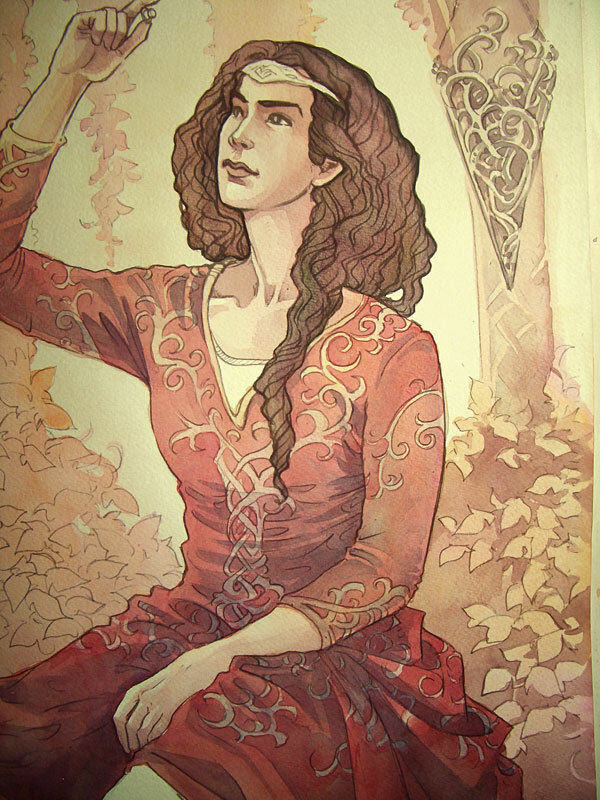 Below: More detailing (lamps, shrubs), deepening of shadows (background, columns, shrubs, dress) and tinting. Tinting is one of the greatest assets of acrylic ink. If a colour isn’t as you want it – add a wash of what you want. Acrylic ink, like watercolour, lightens as it dries, and also “deadens” a little. Overall, that’s like an inbuilt safety net, with unlimited correction possibilities, as you can always just add another layer as you find you need them. You can see I work in a sort of island hopping approach – deepening shadows in different areas of the painting as I feel necessary, to keep the overall thing coherent. 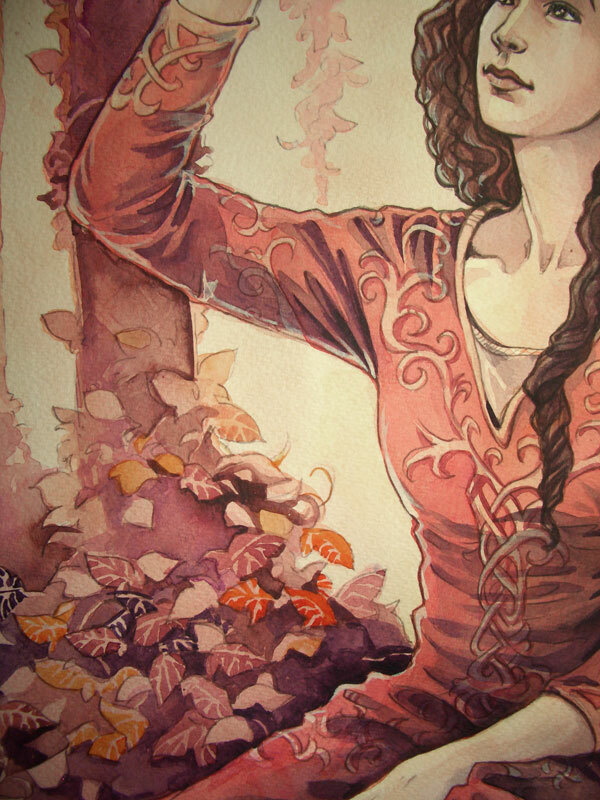 Lastly, a bit of more detail work – the leaves, and some highlights on the figure. Lovely tutorial! 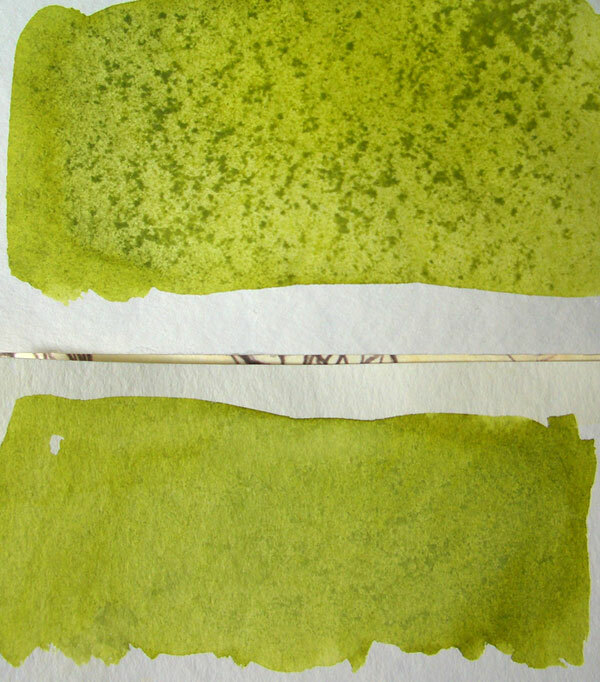 Though I don’t use such ink, it’s always useful to get a glimpse of new materials. 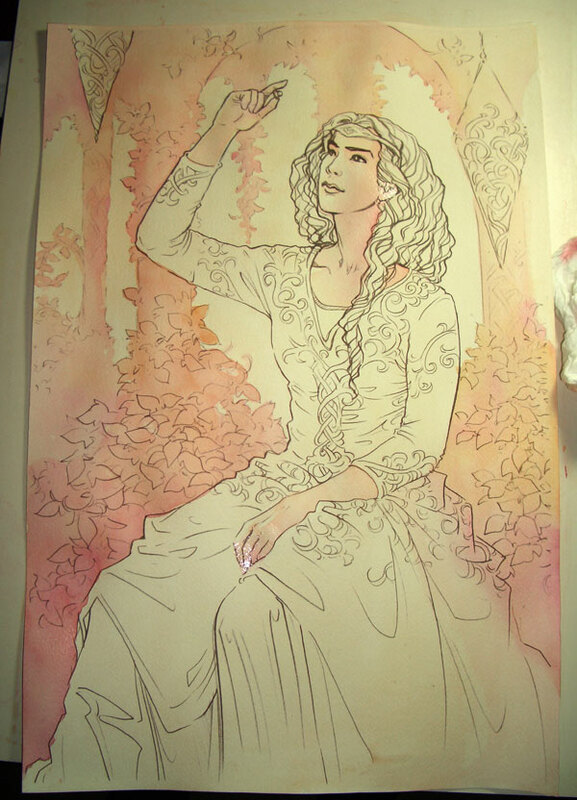 Btw, I was meaning to ask you – do you have any tips on how to scan watercolors and to make the best of them digitally? I can never get the pictures look vivid, yet not over-saturated. It helps if you know your way around with photoshop – sometimes, I have to do considerable postwork to make a scan look like the original again. A good scanner is essential (and good scanners don’t have to be expensive; I loved my old CanoScan Lide 90)! Thank you for your reply! If you’re considering topics for future tutorials – I’d love to see a “post production” one in the future if you have time/desire. Could you possibly do some drawing tutorials, because the initial drawings you make before you paint are pretty dang good, and I want to know how you get your lines to be so varied in depth and so dark, like what kinds of pencils and such you use. Would greatly appreciate it. I have been getting into painting with these inks particularly the FW and Liqutex, I was using Zen watercolor brushes but found that they stopped behaving like brushes after a few uses. (have gotten stiff and less useful) I always rinsed them out well with water, but perhaps that is not enough. I also considered that perhaps I need to get a set of acrylic brushes instead or brush cleaners. Do you have any suggestions? I love working with these inks but want my brushes to behave like brushes! Hm, you mean they became clogged up or stiff? The general rule would be to rinse them frequently and thoroughly, and maybe artists soap might help? I think I used that everytime I had painted with acrylic inks, and none of my brushes have suffered. Never let acrylic ink dry on your brush, obviously. :) If you don’t have artists soap and can’t get any, shampoo usually works well too. Learning some art now. This is amazing medium. I know this is like three years old, but thanks for posting this! I’m starting with acrylic inks for painting due to difficulty with watercolours and them fading when used over one another – so I’m hoping following your steps loosely will help! Another thing you could try is different paper! Very smooth paper means you dissolve your first layer when you add a second; more toothy papers don’t have that problem.